New New New !! New Kitchen utensils, new mattresses, bedding, living room furniture, new remotes, bedroom tvs, blinds, router.....Welcome 2018! There is something about a log home experience ... rest and relax ... enter into a secure environment ... away from the noise and traffic of everyday life. We are located here in Lake Lure NC. This is a secure and quiet community with much privacy. As you approach the mountains you see the views all around. We are there. Our cabin is in the view! Enjoy peaceful evenings on any one of our 4 decks. Listen to the katydids . . . fire up the grill, enjoy your favorite team or a great movie on the big screen over the FIRE PLACE !! Read, relax, and enjoy your time away, here at the most 'peaceful place on the planet.' Three bedrooms have satellite TV,cabin has hi-speed internet, and cell phone service is no problem. The cabin is almost new condition and so is the furniture. We now have three bedrooms with queen beds and a forth with one twin. There are also two twins in the loft with a bath. Of course Riverbend is only 2 minutes from the Town of Lake Lure and the lake. Groceries, restaurants, road-side stands and antique shopping are all around. This location will give you every opportunity to dine out at some of the most reasonable restaurants yet quality food. Seafood, steaks, Italian, Mexican or simply pub style, there are menus galore within a 10 minute drive. Of course, all modern conveniences of home, including gas grill, are available for your cooking and food prep desire at the cabin. Don't forget Chimney Rock and its quaint little town is only 15 minutes away.If you ride , Hwy 64 is the best motorcycle alley in NC..
Venture to nearby Ashville, Hendersonville, Greenville/Spartanburg, or Charlotte, only a short enjoyable ride of about an hour. A great Location for a memorable get-a-way, professionally managed by a local firm. Peace, quiet, decks, trails, etc...according to the time of year...All seasons have their times. Summer... swimming, fishing, homemade ice cream. Fall... leaves, football on the big screen, Thanksgiving. Winter... Ski retreats, hot cocoa by the fire. Spring...flowers, baseball, trails, football. Always the quaint towns and shops year around...Heck, watch the race on the Big Screen ! Up to 15 seats, on huge rear decks, private side decking with rockers..
Had a great time. I felt right at home. Everything worked and it was quite an adventure leaving and coming with all the winding roads. We brought so much stuff with us and we were super comfy. Even our beloved dog. Grocery store is about 10 minutes away and if you forgot anything or need anything its there. I thought the gate would be tough but it wasnt bad. I kinda liked being gated in. Its pretty secluded and the view is pretty nice also. We had to clean a little when we arrived such as take the trash out, wash the dishes and wash the linen from 2 bedrooms. The owners son visit the night before and no one came to clean after he departed. I was called by the owner to wash the linen. We also was out of hand soap and toilet paper on arrival. The next day the owner came by and stock things up. It was a couple gathering so we made the best out of the trip. The cabin is nice overall with lots of space. It’s also convenient to nearby outings. Cabin was just as nice as we thought. Thank you so much for your kind words . 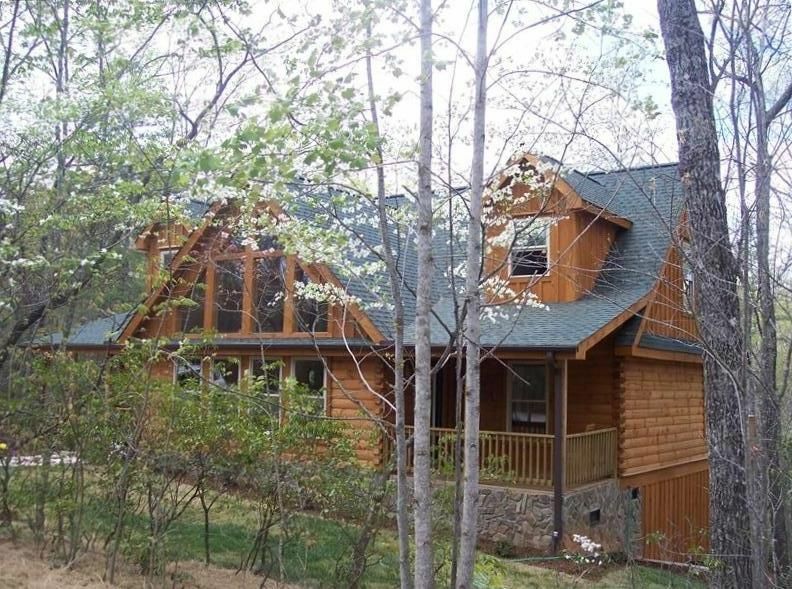 Beautiful cabin, very spacious, very clean, nicely furnished and well maintained. We thoroughly enjoyed our visit and would love to stay there again if we are ever back in the area. Marshall and his wife were an absolute pleasure to work with! Thank you so much ! Come see us again soon ! Really nice house. It was clean and very comfortable. Tvs in all rooms. Only criticism would be that there are numerous light bulbs out and the house could us some smaller pots and a new frying pan. Owner was always available to answer questions. Will rent here again. Thanks for the review....we will get those bulbs changed pronto!